Amsterdam is the European capital of ecstasy users. According to an analysis of European wastewater treatment plants more MDMA is consumed in Amsterdam than in any other European city. The European Monitoring Centre for Drugs and Drug Addiction (EMCDDA) has estimated the levels of consumption of different recreational drugs in major European cities. The Centre uses a process of back-calculation to estimate the consumption of drugs based on the trace amounts entering wastewater treatment plants. You can browse the results of the EMCDDA's analysis on an interactive map of European City Drug Use. 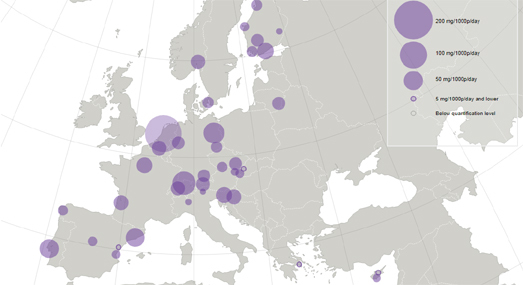 The map shows the estimated levels of drug use for over 70 European cities. The map allows you to view the estimated consumption of cocaine, amphetamine, methamphetamine and MDMA. The scaled markers on the map represent the estimated consumption levels of the drug selected. The map includes a number of filtering tools which allow you to view the estimated levels of consumption for different years and for different days of the week. Cocaine use is highest in western and southern cities in Europe. Cocaine is not used so much in eastern Europe. Amphetamine use is very low in southern Europe. Amphetamines are used much more in cities in northern and eastern Europe. Methamphetamine use has historically been low in Europe, except for Czechia and Slovakia. It now seems to be becoming more popular in parts of east Germany.